Screenshots here do not reflect the current version's look. 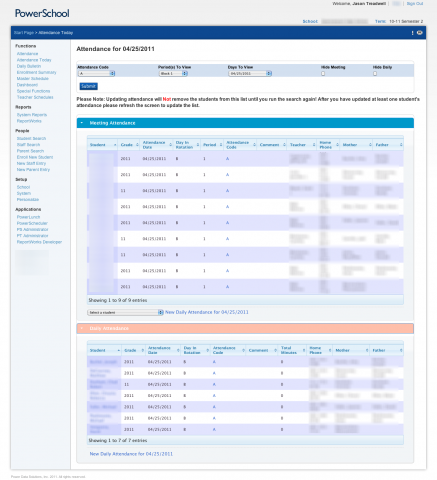 The functionality is the same but the screenshot (for now at least) are from version 4 and earlier. Add New Meeting attendance and Add New Daily Attendance links are now buttons. These buttons now align to the right just like the buttons on all other PowerSchool pages. Submitting a change to meeting or daily will only refresh that section instead of the entire page. As you make changes they show up in nearly real time. Fixed the meeting attendance comments. Instead of the comments being entered into it’s own popup they are now entered into a text area just below the attendance code. Any change to a comment that is left open will not be saved. This is so users can save changes and not save comment changes if they don’t want to (just like the normal page). Fixed link error. Popups should work now. In previous versions of One Stop Attendance we are able to create a link like the following that would set the defaults to what our building staff wanted. This does not seem to work in the newest version. Is anyone aware of a way of doing this? I installed the plugin. When I click the link on the left for Attendance Today it only shows the filter options. The other menus on the screen show for a millisecond but then disappear. Is it a browser issue or something else? Anyone else have this issue? Is there any plan to update this so that the report will work with the new contacts? 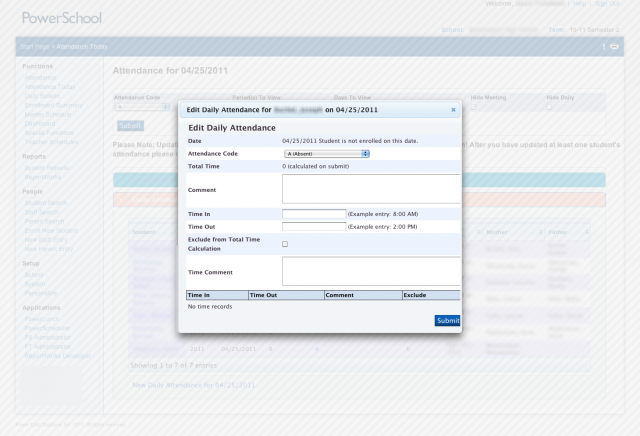 We have recently installed OneStopAttendance on PowerSchool v12. 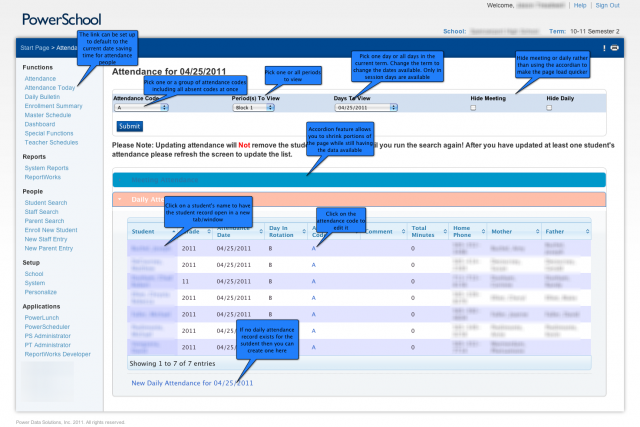 Everything seems to be working correctly except for editing the time in and time out on an existing attendance record. We are able to enter the initial time in and time out, but it cannot be changed after that point. 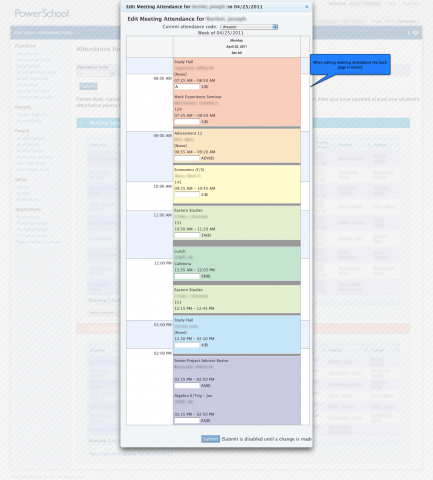 We are able to edit the attendance code and comment, but not the time in and time out fields. Is this a known bug or is there a fix for this issue? Can anyone confirm that they are able to edit time in and time out on PowerSchool v12? Thanks.